Split mode allows you to have DataTable separated into two parts: the "frozen" one and the "scrollable" one. You can freeze either columns or rows. 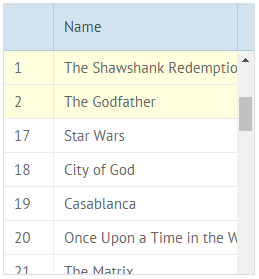 The "frozen" part of the datatable will be fixed, while the scrollable part will remain movable. In the split mode with "frozen" columns the fixed part can contain the last columns on the right/left side of the datatable or on both sides at a time. The movable part can be scrolled horizontally. To 'freeze' columns, you should use the leftSplit and rightSplit parameters correspondingly. Set the number of columns you want to freeze as their value. You can also "freeze" several rows at the top part of datatable. All other rows that follow the fixed ones will be scrolled vertically. You can read more about this feature in the corresponding article. If you have not checked yet, be sure to visit site of our main product Webix web control library and page of datatable html product.